For Soft Landing Missoula, 2018 was filled with more joy, adventure, challenge, and light than seemingly possible. Excuse my baby analogies (you all know I am obsessed), but I feel like 2017 was a year when we were just cutting our teeth and looking around in wide-eyed amazement. In 2018, we started to motor. No more crawling, we are walking now- although at times, still a little wobbly ;) We know more of what we need and want, we can understand other's needs and have begun to meet our own and theirs. I think we saw our largest growth in 2018 with relationships. Relationships with refugee families who continue to awe and inspire us the more we get to know them. Relationships with our community partners such as the Life Long Learning Center, Missoula County Public Schools, Pathways, and the IRC who are all working incredibly hard to make Missoula a place where refugees can THRIVE. And relationships with you all- our volunteers and supporters, who it goes without saying, our work wouldn't be possible without and who we have also just had plain fun getting to know better and seeing more often! One thing we learned about you all last year is how much you guys love to hear about what is going on in the office and around town on the day to day. Along with increased social media content that you enjoyed (Thanks so much Sophia!!! Find us on Facebook and Instagram if you haven't already!) you guys showed us that you really liked hearing about our new and old (mature?) programing, who else is doing great work, and who we are having fun with. To honor this, we will be re-working our newsletter in the near future, and it is my goal to offer you more insight and information on Programming, Partnerships, and People (catchy huh?) moving forward. We will certainly still announce events in the newsletter, such as our World Refugee Day soccer tournament in June, Welcoming Week activities in September, monthly Supper Clubs (see below for the announcement of the January date and menu! ), a VERY EXCITING new food initiative in the pipeline, and many other ways to celebrate throughout the year. We will still shine a light on local, state, and national action related to refugees and immigrants and we will still let you know of ways to get involved through volunteering and donating. We are so excited about serving refugee families and you all even better in 2019, that we started the year off with a little creative and simple project that will hopefully make everyone feel a bit more valuable and connected. 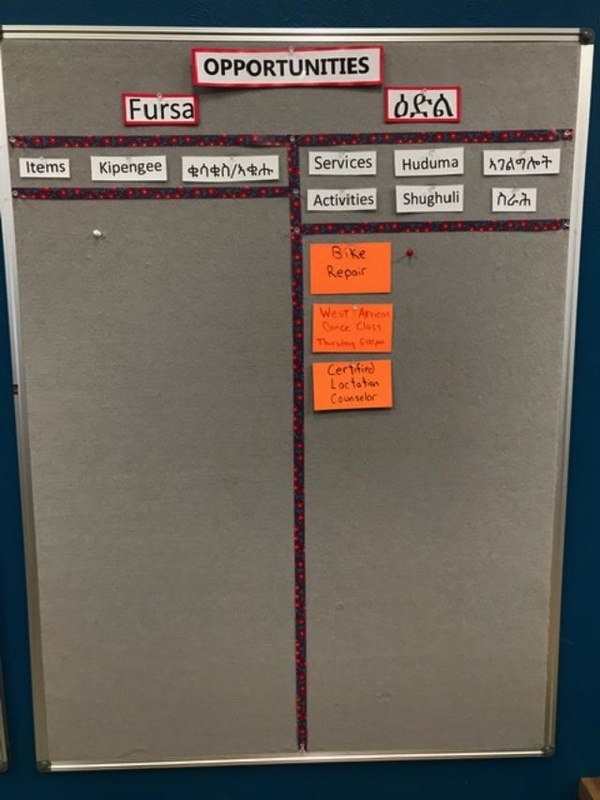 On the largest wall in our office, we have put up 3 huge Resource Boards whose purpose is to post Wishes and Opportunities for both refugee clients and the Missoula community in order to better facilitate those relationships and connections that serve each party. On the "Opportunities" end, this can be something as simple as posting an available couch to find a home in need or something more comprehensive such as offering a service like lactation consulting for new mothers. On the "Wishes", we have already found things such as gymnastics lessons and help setting up WiFi. These boards go both ways and we highly encourage you to call in or visit our office to post something and see how you might be able to get more involved. We love you. We are grateful for you. And we are looking forward to a dynamic, life-affirming, and fun 2019. Lets do this Missoula! Join us at Masala for Soft Landing Missoula’s January 27th supper club! 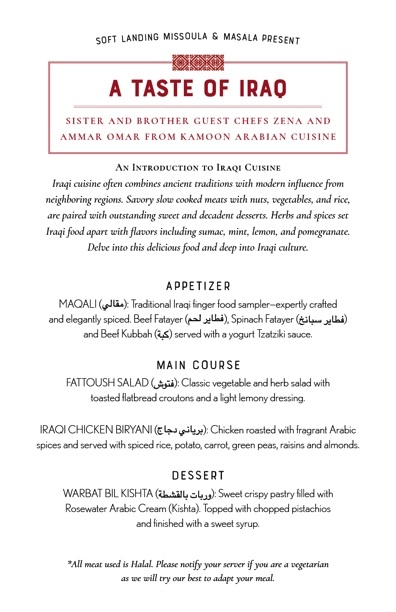 This month we are so excited to showcase the talents of guest chefs Ammar & Zena Omar, brother and sister, and owners of the new food truck and catering business Kamoon Arabian Cuisine. This will be an excellent opportunity to explore new flavors while supporting refugee entrepreneurship in Missoula, MT! Check out this great recent article from the Missoula Current. View more details and see how to make reservations here. Act quick- they go FAST! Are you a volunteer, mentor, teacher, friend, or refugee that is interested in learning what it takes for an English Language Learner to access higher education and increase opportunities for career and financial success in America? Saturday, January 26th, the Life Long Learning Center, Job Services Missoula, and the International Rescue Committee are putting on an informational session to help us all understand goals, timelines, and steps we can take together to help refugees achieve these goals! More information available here and on poster below. If you are in or near Dillon, MT today, join myself, Mayor Wilmot Collins, and Jen Barile of the International Rescue Committee for an Opening Reception and Panel Discussion for UMW alumni Madeline Scott's incredible photo exhibit "The Lucky Ones". This unique project chronicles the lives of refugees arriving in Boise in spring of 2017 during the turbulent time of travel bans and national fervor. See poster below for times and location info.